Society has conditioned us to accept noise as the norm, whether we’re at work, in the car or at home. In reality, these distractions should be exceptions to the rule. With The Foam Factory’s economy-sized 72 inch by 80 inch sheets of charcoal eggcrate acoustical foam, any space can experience noise reduction and better sound quality, giving us a little more peace in our lives. When people hear “acoustical foam,” many think of a product that is utilized only by sound professionals and audiophiles. Actually, acoustical foam has applications in nearly any setting, from businesses to your own car. The Foam Factory’s economy eggcrate sheets, 6 feet in width and more than 6 feet tall, are available in 1-1/2 inch and 2-1/2 inch styles and are practical for any use where sound dampening is desired. Eggcrate’s peak-and-valley design possesses a greater surface area than flat sheets at a better price because of its manufacturing process. A full sheet passes through a studded convoluting machine that applies patterned pressure to the foam while a blade cuts through the center of the material. When released, two sheets of eggcrate foam emerge. By getting two products for the labor of one, reduced production costs become savings that are passed directly to the customer, as The Foam Factory is both the manufacturer and retailer of their products. Eggcrate can be easily modified or trimmed at home or at work to fit within any space by using a gentle sawing motion with a sharp, serrated knife or an electric knife. 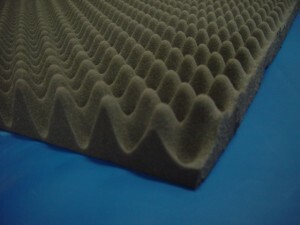 For uses that require the cleanest, most precise cuts, The Foam Factory also offers cutting services, either by computer-controlled machinery or by hand from trained and experienced employees. The value of these 72 by 80 inch eggcrate sheets shouldn’t imply that they are of lesser quality than other acoustical products either. These products are made from the same grade of acoustical foam used in all of The Foam Factory’s other sound treatment products, in both colored and standard charcoal varieties. It also achieves the ASTM E 84 standard’s highest Class A rating for fire retardancy, just like the other acoustical foams. This makes it practical for locations that require materials meet certain safety standards* before their installation. With more than 40 square feet of area to every full eggcrate sheet, they are particularly useful in industrial or factory settings, where large areas can be covered at once with a single product. The high ceilings, expansive walls and sound-reflecting building materials can create echoes and amplify reverberations from machinery noise and even conversations. Noise will always be present at work sites, but its impact can be minimized. That noise can even become dangerous, should it reach levels that distract from work requiring a high degree of focus or prevent clear communication from one individual to another. Appropriately placed charcoal eggcrate sheets can offer sound reduction in these large areas. It is also very helpful for absorbing sound where production areas or warehouses are connected to offices and retail areas. Smaller businesses and public areas can also benefit from the sound dampening of acoustical eggcrate foam. In the home, acoustic foam can be used to create quieter areas that diminish noise from pets, neighbors or appliances. For homes that have rooms over the garage, vehicle and the garage door noise can severely limit the use of these versatile spaces. The installation of acoustical eggcrate sound foam in the ceiling of the garage can help reduce the transmission of noise to the room above. Pets are also notoriously noisy and in some cases, that noise may force you to either find a new place to live or get rid of the pet. Animals like frogs and birds that reside in confined areas but can generate a surprising amount of noise can bother neighbors if walls or floors are thin. Treating a room with sound deadening materials can help reduce the amount of noise transmitted out of your residence into others. This can also help if your neighbors are the noisy ones and building management is less than helpful in rectifying the situation. Laundry rooms are also a practical location for sound insulation. Vehicles are yet another place where noise can be detrimental. Be it road noise generated by the car or distorted sound from speakers, foam can help reduce these issues. Lining trunks is one of the easiest sound control methods for a vehicle by helping reduce echoes and flutter generated from speakers, boosting sound clarity. It can also diffuse road noise that gets trapped in these areas. 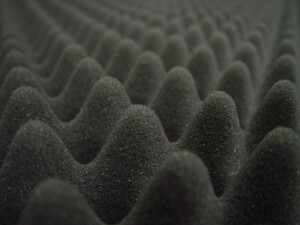 There are multiple mounting options for acoustical foam, depending on the installation’s permanence. Even with its size, the 72 by 80 inch acoustical eggcrate foam can be mounted without sagging with nails or pins spaced every 1-1/2 to 2 feet. This is the suggested method for permanent or temporary setups, because the only repair work consists of re-filling tiny pinholes. Mounting to a hangable intermediary board minimizes installation and also makes the sound treatment foam easy to relocate. Mounting directly to the wall with spray adhesive is suggested for permanent installations. With its size and ability, economy eggcrate acoustical foam is a superb general-purpose sound treatment product for those looking for a solution to noise issues. It can be cut into multiple pieces for various applications or used in its entirety as a single piece. That versatility and value makes this The Foam Factory product the right choice for those who value peace and relaxation. *Always check with local building regulations before the application of sound treatment materials. How much is this stuff?? ?